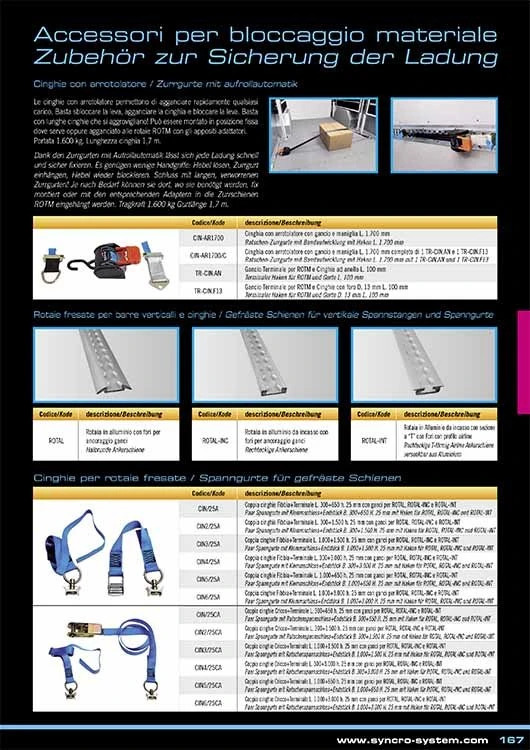 Catalogue no.19 is organised like the previous edition, with colours to guide users to the section they need. The introductory section containing the history of the Syncro Group, production methods and examples of special racking systems is identified by the colour RED. ORANGE identifies the floor and wall liner section; GREEN identifies the biggest section containing most products; FUCHSIA identifies the accessories section; roof transport systems are in DARK BLUE, loading ramps in YELLOW, and examples of racking systems in different models of van are in LIGHT BLUE. The new type of shelf designed with express couriers in mind. For more information, click here. 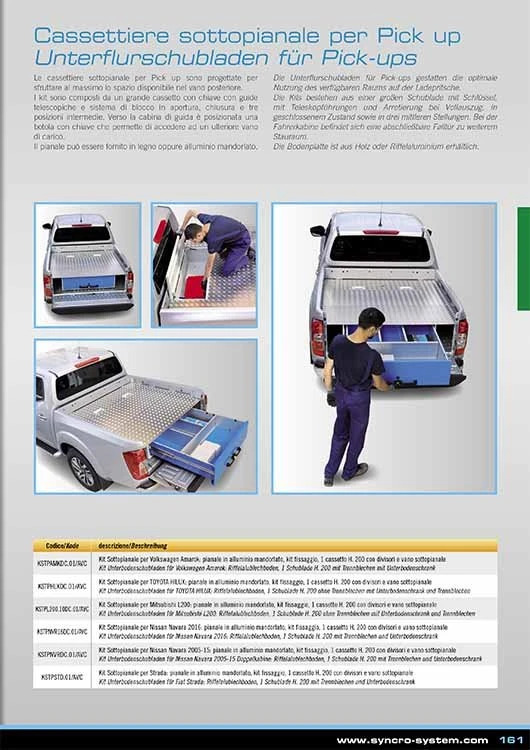 A special storage kit for pickups: a large, lockable, fully opening drawer with a lockable storage well and a choice of covering floors. To learn more, click here. A simple new cargo retaining system that works just like a seat belt. Click here for details. 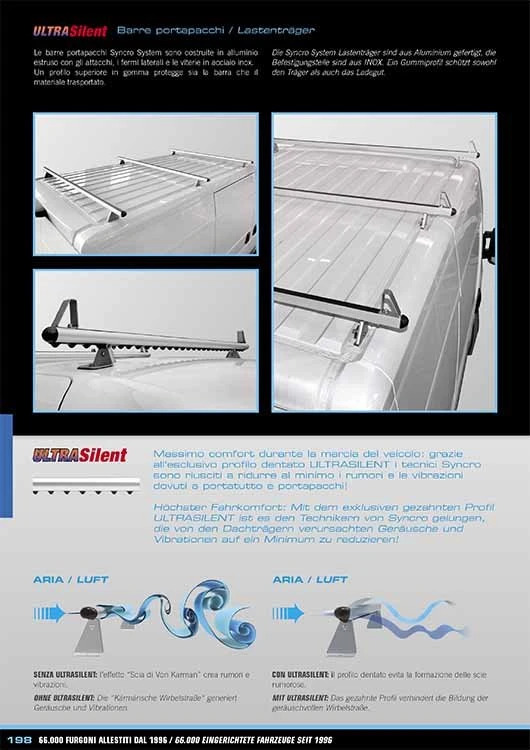 The roof transport section now features Syncro’s revolutionary Ultrasilent profile that reduces noise and vibration on the road by an amazing 50%. The examples section has been expanded with new installations in the 2016 Citroen Jumpy and 2016 Peugeot Expert (page 239) and 2014 Iveco Daily (page 269). Various minor modifications have been included in the pages describing the products in question. 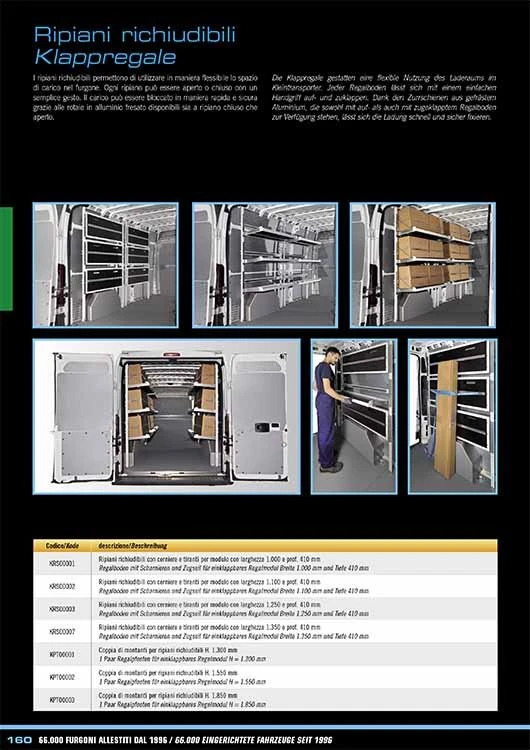 The cover of this year's catalogue has an aluminium treadplate background and features a fully equipped van and tilting transparent containers in its central image.